Traditional Country, Honky-Tonk and Tex- Mex with vintage guitar and steel sounds. "Don't Tell Candy" is the follow up cd to the 2005 release "One More Time" which recieved generous airplay in Europe, Australia, New Zealand and Japan along with favorable reviews in Take Back Country, The Austin Chronicle and several country music websites in Europe. 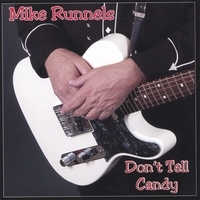 Musicians featured on " Don't Tell Candy" are Mike Runnels,vocals, Ron Flynt, guitar,bass,piano organ,and background vocals, Andrew Nafziger, lead and baritone guitar,Nick Wells,drums and percussion, Herb Steiner,pedal steel guitar, Floyd Domino,piano on tracks 2,3,8, Chip Dolan,accordian on tracks 4,and 9, Scott Blesener , violin on track 10. Produced by Mike Runnels and Ron Flynt. Recorded at Jumping Dog Studios, Austin, Texas. Mastered by Nick Landis at Terra Nova Digital, Austin , Texas. Photography and design by Chris Butler.